Designed for gas hearth appliances that use millivolt valves or electronic spark ignition systems, the millivolt thermostat remote control features Up/Mode/Down as well as Timer/Set buttons for added convenience. 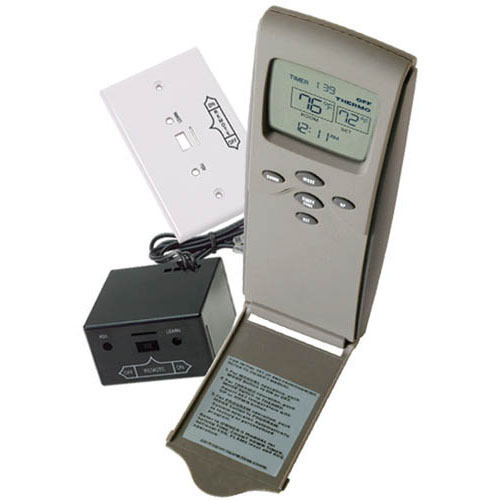 The LCD shows both room and thermostat temperatures along with a 9-hour countdown timer and 24-hour clock. A flame icon and a low battery indicator alert you to any problems. You also get 18-inch wires for connecting and a snap-on wall plate for the receiver that fits in your hand. Can this remote be set up to program automatically? This particular remote cannot be programmed for various time periods. However, the 3301P features a 7 day / 4 period per day program functionality. Does this remote's receiver need to be spliced into any wires when a blower is attached to a Napoleon GDS60-N? It does not. The blower is an independent component from the remote receiver and will continue to operate from its dedicated 110volt power source. The remote receiver will only need to be connected to the gas valve terminals, via the pair of low voltage wires that are included. Is the system already synchronized or I do I have to do that? In most cases, the remote and receiver will already be paired to one another from the factory, however it is necessary on some occasions to perform the learn procedure again. This is a fairly easy process and will be covered in the supplied manufacturer instructions. Awesome I replaced a older model which did not work anymore. Easy buy fast delivery. Awesome company! Very happy works great. Thanks 5 stars!!! The first thing we noticed when shopping for a remote controlled thermostat for our fireplace was the sheer number of different models that exist. After wading through this veritable sea of remotes, we finally chose this unit. If you already use a wall switch to control your gas unit, then getting this receiver installed will be one of the easiest things you have ever done. It is literally just a switch job. Unplug the leads leading to the old switch then plug them straight into the thermostat. After everything is attached how it is suppose to be, cover the thermostat with the face plate. It actually comes with two different colored face plates, which is convenient. Also, the manual is simple to follow when you go to actually pair the receiver and remote. Being able to change the batteries without taking the thermostat our of the wall would be a nice change. The size of the screen makes reading the thermostat from across the room very easy. Thankfully, this unit isn't too complicated to operate (although if you plan to do all of the advance programming, I wish you luck and speed). If you are just looking to be able to pick a temperature and leave it alone, this will work great. A no hassle installation and the ability to turn your fireplace on or off without having to get up make this an excellent choice for convenience. I can guarantee you will not be disappointed in this thing. The manual is well written, so it makes actually getting the thermostat set up very simple. It has functioned perfectly since I started using it. I plan on using this model in the future as well. Anyone that has tried to keep the room at a comfortable temperature with a manually adjusted gas fireplace realizes the absolute pain it can be to find that perfect temp. We needed a solution that did not involve doing a major remodel to install a wall mounted thermostat, and after a little bit of searching we discovered this gem. It worked flawlessly straight out of the box. After the first time pairing of the remote with the receiver unit, it hasn't had a problem even when six yards from the fireplace. It is pretty nice how well this unit maintains the right temperature in the house. It won't take you much time at all to get it installed. My wall thermostat was a bit far away from my fireplace, so it did not always successfully control it. Sometimes it would turn it on successfully, but other times it wouldn't. Since I have installed this setup, it works great. I really like the remote feature so that I can control it from my chair. It was very easy to install without a lot of fancy tools or know-how. I am quite pleased with it. Waking up to a house that is already warm is one of the best feelings in the world. Our fireplace remote control unit finally gave up the ghost, so we decided to search for the same model since it worked so well for us. Thankfully, they are still selling it, and getting it set up was very easy. All told, we probably spent less than fifteen minutes actually getting it set up and actually programmed how we wanted. Being able to set a range of temperatures that you want the fire too keep is definitely one of my favorite features. It can be a little tedious to try to keep the temperature of a room constant with a gas fire, especially if you have to continually get up to go and change it. I had a little bit of a problem keeping the room from getting to hot without watching the fire continuously to make sure I turned it off at the right time. I am actually pretty impressed at how accurately this control maintains a comfortable temperature in the room. My previous fireplace thermostat had started to malfunction, so I decided to go with this unit. I am very pleased with the quality of customer service, and the first rate shipping job. It came very soon after ordering and was in perfect condition. When I went to get it set up, I was fairly surprised by how easy it was to actually get in the fireplace and it functioned flawlessly. I can honestly say that this remote is doing exactly what I expected it to do. No surprises, and works out of the box. Although it really didn't take very long to set up the actual receiver, there was some delay that I chalked up to several hard to reach places and a lack of planning. Finding the actual contacts on the fireplace itself can be a little bit of a chore. They are usually in an awkward place to begin with, but since I didn't bother to check they beforehand there was a little bit of fumbling around when putting it in. Also, don't be worried about it getting too hot in your fireplace. The unit actually has a little alarm that can tell you if it is about to overheat before it causes any permanent damage. I am extremely pleased with this product. I found the installation process to be very easy. I had no trouble at all getting it programmed for use. The directions were very easy to follow. With this device, my wife stays comfortably warm, and I don't have to keep getting up to adjust the fireplace. I wish I had made this purchase a long time ago. I highly recommend this product. I bought this system to replace a similar set up from a different manufacturer. Overall it works fairly well and has many of the same features, but there are some disappointing differences. First, I am having trouble keeping the batteries in the remote. The battery compartment is covered with a small plastic plate that is held in the device by two tabs. The tabs don't seem sturdy enough to keep the batteries in the compartment. I also don't really care for the display. The letters are on a dark gray screen and are not very bold, so they are hard to read. The display on my previous device was larger, the letters were bolder, and the screen was nearly white. I love Skytech's quality goods, and have had a Skytech unit on my current fireplace for close to ten years. The older unit is completely manual, so we would have to keep an eye on how hot it was getting in the room to make sure we could lower the height of the flames when it started to get uncomfortably warm. After a little bit of back and forth with a store near us, they told me to get this unit to put on my fireplace. Unfortunately, the prices at the store itself were enormous compared to the online price, so after a quick delivery I was able to attempt to install it. I say attempt because it turns out that when you have variable flame height you can't actually get a thermostatic remote that works with it. My advice is to check out your fireplace before you go shopping. We have actually purchased two of these units to control gas fireplaces. One is used in our primary residence, while the other is installed in our vacation home. Since they use battery power instead of plugging into the wall, they can continue to operate in the event of a power outage. This ability allows them to turn the gas fireplaces on and off and keep the house warm even without electricity. Of course, they cannot make the fireplace fan function during a power outage, but just the heat is a huge help. Even with steady use, the batteries in the remote lasted for more than a year, so you don't have to worry about using lots of batteries. Getting the house to a good temperature and keeping it there is probably the biggest reason that you should consider buying one of these. I can easily recommend. Everything that should have been in the package was. I was amazed at how quickly the package came. Literally overnight. After eight years of faithful service, we had thought that our Skytech remote had finally decided to die. We started checking over it to make sure it was done, but thankfully discovered that somehow the fan control switch had been turned on. Weird that it seemed to do it without any intervention, but we have not had a problem with it working properly since then.